Ronald Ortiz-Magro, wearing red shorts, was arrested by Seaside Heights police. Prosecutors in New Jersey are investigating another fight involving a cast member of MTV's "Jersey Shore." show. Seaside Heights police arrested Ronald Ortiz-Magro after a Sept. 4 brawl that started on the boardwalk. In an upcoming episode, the 24-year-old Bronx, N.Y., resident is taped fighting another man. Senior Assistant Ocean County Prosecutor Hillary Bryce says the victim lost consciousness. Bryce says authorities are trying to determine whether it was an aggravated assault or simple assault. “This was a fight where the victim lost consciousness. We’re investigating it now to see if it’s aggravated assault or simple assault,” Bryce told The Press of Atlantic City. “I guess we’ll have to watch the next episode to see what happened,” she said of the alleged assault. Bryce says the victim's name is not being released at this time. 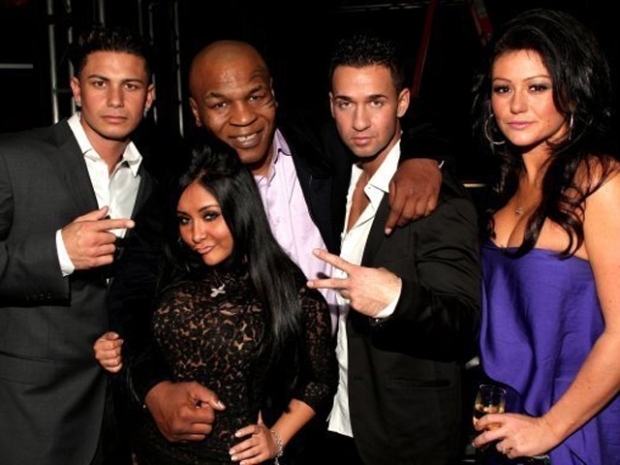 Fellow cast member Nicole "Snooki" Polizzi was punched in the face in a Seaside bar in August.